Peaches was a rescue dog who liked being the only dog. A big, arthritic German Shepherd, she had the air of a retired police dog (though she wasn’t one). On walks, she avoided other dogs, and when house guests visited they had to leave their dogs at home. One night on a walk, she suddenly dragged her people across a street toward another dog. They feared her attitude had worsened and that she was about to pick her first fight. Instead, she stopped next to a morose stray and sat down. Never had a dog looked as unhappy with freedom as this stray did. The stray was short and funny-looking, with a barrel chest and a long pointy snout. The people named her Edna and – with Peaches’ clear permission – they brought Edna home. No one ever answered the Lost Dog signs they plastered around the neighborhood and so Edna joined the family. Peaches continued to tolerate her until Peaches succumbed to various old-dog ailments several months later. Edna lived for many more years, delighting all who met her with her goofy, gregarious, and loving ways. 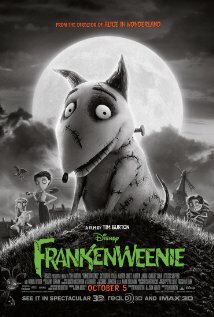 Edna looked like a cousin of Frankenweenie. Yes and I am so glad they do.